I brought a whole bunch of stuff down from the attic tonight. I had mentioned that I was thinking stamps again. I had been looking up Japanese stamps on the internet. There are a few places that you can see stamp scans at. I haven't been around the stamp hobby for several years now. The last album supplement I bought was 1998. I was using the Scott Country Albums for Japan and Iceland. I had made my own pages for Canada. I looked online for the 1999 supplement and I haven't found one. It's not available from Scott anymore. They package the yearly supplements into a larger pack every so often. Unless I find some dealer with an old year set I will have to buy the 1995 to 1999 year set. The 2000 and on are still available as single years. That could cost me a hundred bucks for the last ten years, maybe more and half again for Iceland. Island doesn't have so many stamps. Japan or Nippon is like the USA, and many other countries, who issue a whole lot of stamps with many topics of interest. They are pandering to the collector market. Stamp collectors were complaining about it 5 years ago and it doesn't look like anything has changed. I like the older stamps anyway. These two stamps. They are from Japan, Scott numbers 523 & 524, Skiers on Mount Zao. They are a set that was issued Feb 15, 1951. Some how the artist makes skiing sort of interesting. It's the background that I like and the colors of the stamps. They used a lot of soft colors back in the first half of the century, like the above set. I don't have the skiing set, there's one on eBay for 13 bucks. A used could run 2-4 bucks. 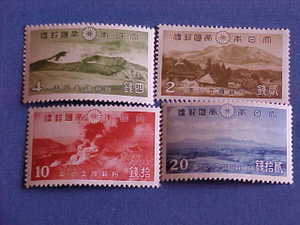 The set of 4 above is Scott 290 - 293, a 1939 issue with Japanese mountains. The Scott value is over 85 bucks for mint never hinged. There several sets on eBay right now that range from 20 to 45 bucks. The 45 buck one is the mint never hinged. A hinge is a bit of thin paper. It's used to hold the stamp in the album. It's coated with glue on one side and folded. A bit of a lick and your stamp is securely fastened to the album page. The glue holds but once it dries it can be peeled carefully off the stamp and album with little or no damage to the stamp. There is a bit of a disturbance to the glue which can lower the value of the stamp. Scott is the big player in the American Stamp catalog scene. There are other stamp catalogs about the world and they use different numbering systems. Scotts is now up to 6 volumes and cost near 300 clams a year. I have an old set from 1995 which lists stamps through mid 1993. It was only 5 volumes then. There are a lot of stamps out there. More than a couple of hundred thousand.